Several years ago, a teenage boy stumbled upon an old swivel gun in Darwin, Australia that was found to predate the arrival of the acclaimed Captain James Cook to the continent in 1770. New research has now linked the cannon’s led to a mine on the Spanish Iberian Peninsula, suggesting that the Portuguese reached Australia not only before Cook, but also before the Dutch made the first European sighting of Australia in 1606. Every child in Australia learns about the ‘heroic efforts’ of Captain James Cook, the British explorer, navigator and captain who is credited with leading the way to British colonisation of the country, and who in many cases, is also credited with being the first foreigner to discover the land. However, ask any Australian who Willem Janszoon is, and they will most likely respond with a blank look. In fact, he was a Dutch navigator who reached Australia 164 years before James Cook. But this is not taught in Australian schools. 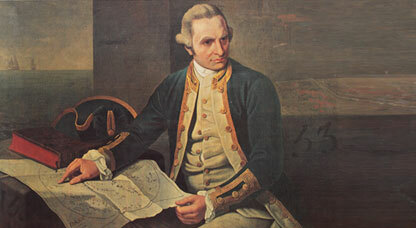 An artist’s impression of Captain James Cook. Image source. The new study conducted by the University of Melbourne has shown the lead in the 16 th century cannon most closely resembled metal found at the ancient Coto Laizquez mine in the Andalusia region in Spain's south. The historians compared lead in the cannon to ore samples obtained from 2000 European sources and ruled out the theory that the gun was a later Asian copy of the Portuguese swivel. A Darwin-based heritage group, Past Masters, said that the findings showed the lead in the gun was mined on the Spanish Iberian Peninsula. 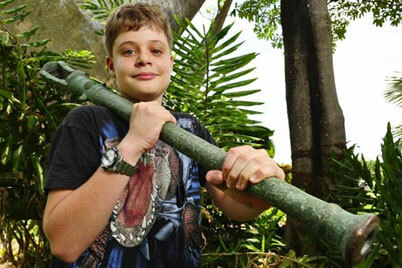 16th-century swivel gun found by Christopher Doukas, 13, in Darwin. Photo source . 'This truly is the smoking gun of the Portuguese discovery of northern Australia,' a spokesman for the group, Mike Owens, told The Times . The cannon isn't the first finding that has suggested Australia might need to rewrite its history books. The discovery of Ancient African kingdom Kilwa coins in the Northern Territory, believed to date from about 1100, have long posed questions about foreign visits to far off Australian shores. 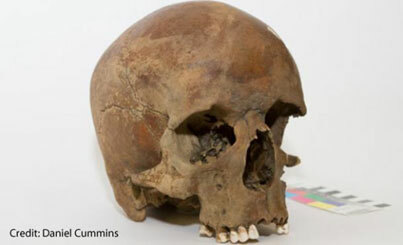 In addition, the finding last year of a mysterious skull of a European male in New South Wales dating back to the 1600s, disappeared from the Australian news, just as quickly as it appeared. Fighting over dates and who was the very first to discover the lands seems rather inconsequential when you consider that the Australia Aborigines inhabited Australia for at least 50,000 years before Cook’s arrival. But there is a bigger issue at stake here than just ‘who was the first?’. The point is that early discoveries of Australia were quietly scratched out of the school syllabus and many history books, as giving credit to the ‘colonisers’ was far more important. Similarly, new discoveries providing evidence of early foreign visits are quickly rejected or swept under the carpet. And this is a common pattern. We know for example, that Christopher Columbus was also not the first foreigner to step foot in the Americas. What we learn at school and what is written in many history books is very often not produced with accuracy in mind, but rather has been written to serve a certain political agenda. The good news is that more and more people are catching on to the agenda and are no longer willing to have the shades pulled over their eyes. Featured image: One of the first ever maps of Australia and shows an adventurer's ship and what looks like a platypus off the coast. Image source . Your artical states that the arrival of the Dutch in Australian waters is not taught in Australian schools. 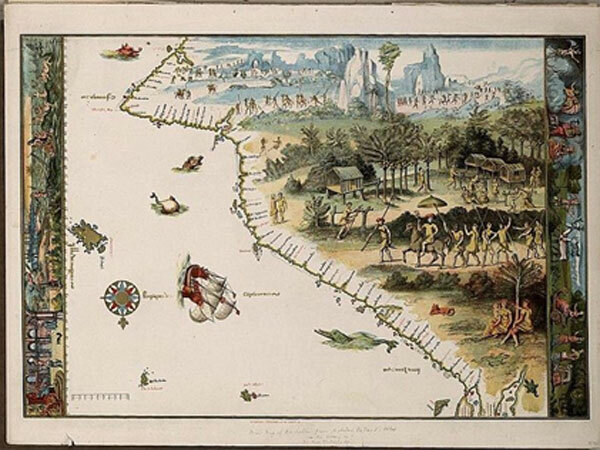 I can't comment about current day, but 50 years ago it was indeed the subject of classroom lessons in Tasmania, Abel Janzoon Tasman discovered Tasmania in 1642, Bruni D'Entrecasteaux a Frenchman visited the east Coast area and so on. The British were only at the tail of a line of European voyagers. I grew up in New Zealand &amp; Alel Tasman's discovery of Austalia &amp; NZ was taught openly as part of the curriculum. Nothing hidden there. That's why the ocean between Austalia &amp; NZ is called the Tasman Sea! Why are you sensationalising this? Cook made a number of trips, Tasman only one. Cook mapped more. Nothing startling about this story to antipedians. Yup, the same exact cannon, created in 1389 AD, knew it at first sight, easily recognized. http://metmuseum.org/collection/the-collection-online/search/37742 is this the same cannon??? "were quietly scratched out of the school syllabus"
Of course this is not as important as the other school subjects which were taught and fraught with untruths. Upon leaving England I was shocked to find that in other countries the British Isles are shown much smaller on foreign maps. The only subject that I was taught and that has remained untouched by them (whoever they are) is math’s all of the other were largely incorrect (deliberately?). It is my sincere belief that all land masses have seen many, many civilsations come and go leaving little trace and if they did leave trace we are not believing, therefore not looking and consequently, not finding. Every thing in nature is cyclic except our concepts, for example evolution cannot be linear from monkey to man. If we looked we might find that a Polynesian group of people found Aus' before the European. Blasphemy!